In September 2011, I took a detour (from composing a flute sonata) to create a book of flute/clarinet duet arrangements of favorite Puccini arias, following similar books of Bach and Mozart arrangements. At the same time, I was filling in for a few months with the Strait Saxophone Quartet which plays a lot of swing arrangements in big-band style. One night at rehearsal I started talking about how so many pop songs from the 1930s and 1940s seem influenced by Puccini's melodic and harmonic style, and that sometimes the resemblance can be pretty strong (for example "Fascination" having the same melodic contour as the main theme of Musetta's Waltz from La Bohème, and "Embraceable You" having a lot in common with Musetta's middle theme. 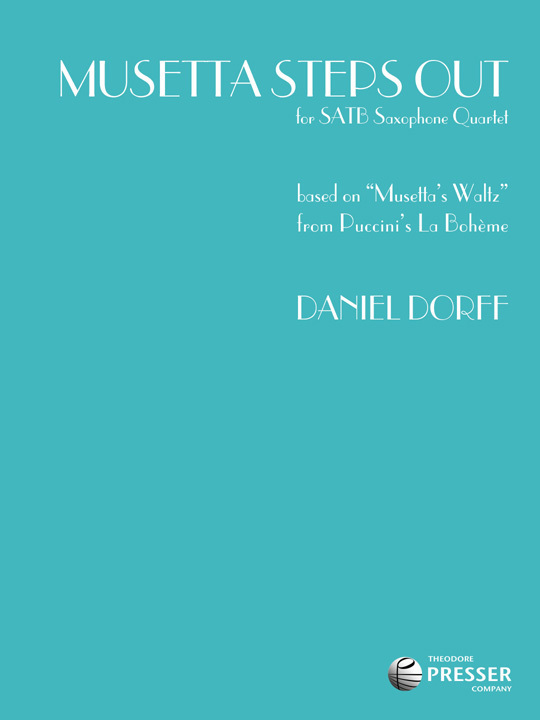 I joked at rehearsal that someone could arrange Musetta's waltz like a typical swing band chart and it wouldn't sound any different from Tin Pan Alley, and I seemed to be done thinking about it. The next morning I became engulfed by ideas for converting Musetta's Waltz into a swing saxophone quartet and sang into my dictaphone while driving to work. By the time I got to the office, I had a complete lead sheet (including countermelodies and bass line) sketched out.